The competitive edge is no longer quality or price—customers now consider them givens. The competitive edge is innovation. It’s a matter of survival in this world of ever increasing rates of change, hyper competition, customer choice, and “rapid commoditization of products, services and capabilities”. The innovation imperative is widely known but how does one change an organization in order to make dramatic and enduring innovation an achievable, ongoing priority? 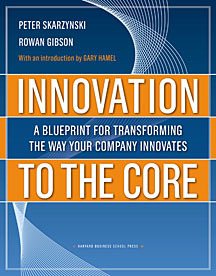 Last week I interviewed Rowan Gibson co-author of Innovation to the Core: A Blueprint for Transforming the Way Your Company Innovates Rowan and his co-author, Peter Skarzynski, provide easy-to-understand information and advice on how to transform your organization into a top performer in continuous innovation. Rowan Gibson: Frankly, yes. If you look at any survey of management priorities these days, you’ll find that innovation is almost always one of the top two or three items on the corporate agenda. But when you ask most senior executives to describe their organization’s corporate innovation system, all you get is a blank expression. Sometimes I’ll be sitting with the executive committee of a large company, so all the C-level officers are around the table. And they all unanimously agree that innovation is the big imperative for the future of their firm. Then I ask them, “Who’s responsible for finance here?” and one of the hands goes up. “Who’s responsible for HR?”. Another hand goes up. “What about IT?”. A third hand goes up, and so on. Finally, I’ll say, “Which one of you is the Chief Innovation Officer?”, and not a single hand is raised. See, what surprises me is that the company has appointed someone to handle every major function of the firm except the one they claim is most crucial to their destiny. What most corporate leaders struggle with is the idea of innovation as a systemic capability, because they may never have even considered innovation in these terms. They might think of it as breakthrough technology, or cool product design, or individual creativity. Or they may know it as a specialized unit called “R&D,” or “new product development,” or “corporate venturing.” But they have probably never contemplated the idea of recalibrating all their core management systems and processes to make innovation an everyday “part of the system”—something that becomes reflexive and natural to everyone. They wouldn’t even know where to begin. That’s why a large portion of Innovation to the Core is devoted to demystifying the innovation process. VB: You point out that the most innovative and high performing problem-solving teams are composed of diversity—of people with different skills, capabilities and perspectives. You also say that we need to add new voices to strategy and innovation discussions—young people, newly hired employees, people distant from the corporate headquarters and people from outside the organization. Is this message likely to be a threat to senior executives including the CEOs of many companies? Rowan Gibson: Some will inevitably view it as threat. There has long been a kind of elitist view in companies about who is responsible for the destiny and direction of the organization, and who should be involved in the strategy-making and innovation process. Once you start involving people from all across the company in this process—once you make it bottom-up rather than exclusively top-down—the senior executives have to let go of their monopoly. They have to start listening to lots of new and different voices. In effect, they go from being the authors of strategy to being the editors of strategy. Their role switches from generating the company’s new thinking to “connecting the dots”—sifting through a wide variety of options and ideas bubbling up from below, and searching for the patterns and fundamental themes that would give overall direction to the company. This is no doubt going to require a degree of humility on the part of many senior executives. It calls for them to recognize that they don’t have all the answers. That they can learn a lot from others—in particular from young people, who have one foot in the future; from people at the front-lines who understand customer needs better than they do; from people who come from outside the company or outside the industry, and who are therefore not blinded to new opportunities by the old preconceptions. I know that some leaders feel anxious about losing control, but it’s part of a much larger and more profound shift in the whole nature of managerial work—away from the old “command and control” model where all decisions were made at the top and meticulously carried out by the ranks below, to a new model based on rapid response, flexibility to customer needs, front-line empowerment, creative solutions, and so on. That’s why innovation has to go from exclusive to inclusive. It’s no longer possible to figure everything out from the top. If you want to generate breakthrough thinking and game-changing innovation, your chances of getting it from a homogeneous group of behind-the-times senior executives are nil. Instead, you need to create a potent mix of diversity, energy, youth, and hustle. VB: You say that everyone has the potential to be an innovator. And yet some people, such as Thomas Edison, seem to have exemplified innovation on steroids. Is the differentiator the working of one’s mind to forge creative thinking or does it have more to do with who one collaborates with in a given work environment? Are there other factors that contribute to the making of a great innovator? Rowan Gibson: We used to think that innovators were wired differently than the rest of us, that they had thinking capabilities which mere mortals—or ordinary companies—couldn’t possibly hope to match. What we’re now discovering is that there is tremendous creativity in all of us. Look around today, and you see a world filled with bedroom DJs, amateur movie directors, podcasters, game developers, bloggers, and citizen reporters. Armed with new, easy-to-use software tools, ordinary people are proving that they are capable of the most amazing creativity. The challenge, therefore, (and the opportunity! ), is to “bring out” all of the latent creativity that currently lies untapped within your company’s own organization—and indeed, across its extended network of customers, suppliers, and partners—and channel it into your innovation pipeline. When I conduct my innovation masterclasses inside organizations, I often get a room filled with people from every different level and function of the company. One of the questions I often ask at the very beginning is, “How many of you would classify yourselves as innovators?”. And out of, say, 100 people, it’s usually only about 2 or 3 hands that go up. But after spending a couple of days with these people, teaching them the skills and the tools of innovation, and having them work together in diverse groups to discover new insights and dream up new ideas, I ask them the same question. And guess what? All the hands invariably go up. Once you’ve started to teach people how to innovate, you need to give them time and space for creativity and experimentation. And you need to help them connect and converse with diverse people across the organization and beyond. One of the great myths of innovation is that it’s all about the lone innovator, sitting there staring off into space, waiting for that “eureka” moment. This view of innovation is not only erroneous, it also does us a great disservice because it creates a false understanding about the innovation process. The reality is that whether we think of Thomas Edison, Ted Turner, Jeff Bezos, or Steve Jobs, those leaders came to important new insights because they embedded themselves in a vibrant web of connection and conversation. Their big ideas were built by interacting and networking with a rich and diverse community of people; they were not exclusively the products of their own intellectual brilliance. VB: You indicate that radical innovators obtain their insights through four lenses—challenging orthodoxies or dogma, harnessing unexploited trends, leveraging underused competencies and strategic assets, and understanding unarticulated customer needs and frustrations. Would you talk about the process you call “crashing”—seeing whether the collision among these four lenses opens up opportunities for innovation? Rowan Gibson: The four lenses of innovation, which we describe in the book, are powerful tools that can help an organization to systematically generate a foundation of novel strategic insights. These insights represent the building blocks—the raw material—for breakthrough innovation. Sometimes, a single strategic insight can be all it takes to stimulate ideation, inspire fresh thinking, and allow you to see an exciting new opportunity. However, in my experience, the innovations that have truly game-changing potential are those that are born at the intersection points between various types of insights. So it’s an industry convention that deserves to be challenged, plus a customer need that is currently going unmet, plus a resource that can be leveraged in a different context, plus an incipient trend that can be harnessed to deliver new value. In other words, radical innovation is almost always the product of “creative collision.” We found this when we researched over 200 cases of successful business innovation. The process of “crashing” is about systematically taking strategic insights and combining them in fresh, surprising ways to see whether the collision opens up new opportunities for innovation. Instead of just putting people in a room together with the mandate to “go forth and ideate”, I ask teams to take an orthodoxy, a discontinuity, a resource, and an unmet customer need, and put them together. Then I ask them, “Does this combination provoke anything in your mind about some new direction for your company? Is there an opportunity here?” In my experience, it’s only when two, three or four different kinds of insights come together that team members start to say, “Wow, look at that opportunity!” I usually find that, in one single day, the teams can generate dozens and dozens of very high quality ideas, growth opportunities and strategic options for the future. By way of contrast, if I took that same group of people and just asked them to try to come with new ideas and opportunities in a traditional brainstorming session, I would probably end up with just five tepid suggestions at the end of the day. VB: If one is looking for radical innovators when hiring new employees, how can one recognize someone who has superior ability to see the world through these four lenses? Rowan Gibson: If your company is trying to build and actively reinforce innovation as a corporate-wide capability, your HR department should profile precisely the kind of people you are looking for, and then try to sift out the most innovative recruitment candidates. The four lenses represent one very effective tool you can use to do that. P&G has revised its recruitment strategy along these lines. Before applicants even get as far as an interview, they are given a batch of problem-solving tests to help recruiters determine whether or not they can approach challenges in a creative way. When considering what the applicants have done so far in their lives, recruiters are also searching for things that indicate a willingness to embrace and commit to innovation, and to collaborate with others in a results-focused way. Once people get through this screening and hiring process, the goal is to further develop their innovation talents through training. VB: You advise companies not to define themselves by what they do but instead by what they know or what they own. It seems relatively easy to identify strategic assets such as brands, patents and customer data. Is it much more difficult for most corporate leaders to clearly identify and define a company’s skills and unique capabilities—what their company knows how to do uniquely and consistently well that sets it apart from competitors? If so, is this a key starting question? Rowan Gibson: Yes, it is. And it’s usually quite a difficult question to answer. After all, what exactly is a core competence? I define it as a bundle of skills, technologies, processes, and values that has become part of the fabric of the company, and that is difficult for others to copy. Some examples we use in the book are MTV’s ability to understand Gen Y tastes, or Nike’s ability to create emotional bonds between individuals and athletes. Here’s what you have to keep in mind: the goal is not just to identify your company’s strengths—it is to identify unique strengths. To qualify as a core competence, a strength has to meet five criteria. It should create value for the customer. It should be unique or at least scarce—at a minimum in your company’s industry, and better yet, in the world. It should be sustainable over a significant period of time. It should be important to your company’s position today. And it should be something you can leverage into new products, markets, or businesses. Once you have listed some candidates for your company’s unique strengths (be they technologies, processes, or skills), carefully compare each of them with these five criteria. Don’t be alarmed if you come up with very few core competencies. It is a high bar, and in my experience, most companies really have only one to three true core competencies. VB: Many breakthrough innovations are not found by examining a company’s products, through traditional market research or asking customers what they want. Instead you recommend becoming the customer—feel the customers’ experience, understand the customers’ problems and identify ways to solve these problems. Is this another key message? Rowan Gibson: Yes. You’ve really got to learn to think from the customer backward, and to design innovative products and services that way. As an example, Haier, the hugely successful appliance manufacturer from China, observed that customers in poor rural areas were using their washing machines not just to clean clothes but also to clean vegetables and even to make goat cheese! Instead of discouraging this practice, Haier recognized the unarticulated customer need, made some modifications to its washers, and put large stickers on them telling customers how to wash vegetables safely and how to make the cheese. The point: developing an empathetic understanding of the customer can be a great way to get deep insights into unarticulated needs. To do that, you need to remove the distance between you and your customers. You need to immerse yourself in their world and make their needs, frustrations, and desires your own. That means getting out of the office and into the field, using a variety of tools and techniques to derive new customer insights first-person—from observation and direct customer experiences— rather than relying on others to conduct research. That’s when the learning goes from intellectual to visceral, and you start to say, “Okay, this is real. We need to start addressing this need.” It’s very hard to ignore something once you have experienced it for yourself. VB: You say the secret to identifying new growth opportunities is to encourage the latent creativity and generation of ideas by empowered employees, customers, suppliers and business partners. You also recommend expanding sources of innovation by using the Internet to tap into the millions of brains outside one’s organization. Would you talk about this huge potential and some of the secrets to doing this effectively? Rowan Gibson: What companies seldom seem to recognize is that one of the best ways to get more ideas into the innovation pipeline is to ask for them. They rarely invite all of their people to get involved in imagining new markets or new growth strategies. What they should be doing is developing a social architecture that teaches and encourages their employees to be innovators, that unleashes the power of their imaginations, and that supports their innovation efforts in the appropriate ways. If they did this, their innovation yields would soar. A great way to get hundreds or even thousands of employees involved in the process of sharing insights and thinking up new ideas is to use the power of the Net. IBM, for example, often uses the Internet for online idea “jamming.” One of these exercises involved two seventy-two-hour sessions of innovation dialogue, based around using IBM’s technologies in radical new ways. CEO Sam Palmisano told his employees it was the first time a technology company took its most valued secrets, opened them up to the world and said, “Okay, world, you tell us what to do with them.” In total, somewhere in excess of fifty-three thousand people participated in this particular IBM “InnovationJam,” contributing many valuable ideas for breakthrough innovations in areas such as transportation, health, the environment, finance, and commerce. Beyond involving your own people, what you should also do is recognize the enormous potential for innovation that exists outside your organization—across your extended network of customers, suppliers, and partners. Try to put mechanisms in place that allow you to employ some form of “open innovation.” Again, the Net is a great way to tap into the world’s ever-expanding reservoir of human creativity—to engage the imagination and know-how of literally millions of brains outside the organization. It represents the power to open up your company’s innovation processes for free trade with the rest of the world. The most exciting thing about the Net is that it allows your company to connect with people outside the organization “whose passions match your problems,” as Gary Hamel likes to put it. Consider the way Linux, the open-source operating system, was developed. It is currently estimated that Debian GNU/Linux, which includes more than eighteen thousand software packages for eleven computer architectures, contains more than 213 million source lines of code. This translates into tens of thousands of person-years in terms of development time. If Linux had been developed by software coders who were compensated for their work, it would have cost billions of dollars. Instead, it was created for free by a worldwide community of volunteers, in a similar way to Wikipedia, the online encyclopedia. Make it your company’s goal, therefore, to raise the ratio of externally sourced innovation to internally sourced innovation. The better an organization becomes at harnessing ideas and energies from outsiders, the better its innovation yield. VB: In your article “What Next?” published in Management Today in 2007 you state “we need to put learning, creativity and innovation at the top of the business agenda”. Would you explain why you say that? 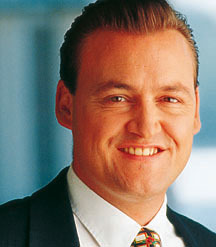 Rowan Gibson: With business strategies having shorter useful lives than ever before, the proportion of time, effort and bandwidth—at both an individual and an organizational level —that is devoted to sheer execution is going to have to go down relative to the proportion of energy that goes into learning and creating. Why “learning”? Quite simply, because more and more change means more and more new things to learn about and absorb. It has been estimated that about 12% of everything human beings know today has been learned in the last five years! Learning is less and less about looking backwards. A lot of management literature draws its lessons from an era that is gone—an era when change was much slower and better-behaved than it is today. Take a book like Built to Last, for example, written by Jim Collins and Jerry Porras. It tries to explain the secrets of corporate longevity by looking at companies that have been around for a long time—which is fair enough. Built to Last analyzes companies that were able to do very well between 1950 and 1990. But how much can this really tell us about a company’s ability to thrive in the decade after that? Or in the time frame from say, 2008 to 2045? Learning today is about looking forward, not backward. It’s about trying to develop foresight about industry evolution and incipient trends and the implications of new technology, faster than the competition. It’s about developing a deep-down sense of the “discontinuities”—the things that are driving change, or that potentially could be harnessed to drive change. And it’s about constructing an imaginative point of view about the compelling new opportunities that emerge out of that understanding. But learning is only one part of the equation. The other part is creating. As the old business models, the old strategies, the old products and services lose their economic earning power faster than ever before, we have to learn to create new ones just as rapidly as the old ones disappear. This presents us with a big challenge because most of us are already pretty stressed just getting the execution part right. But one thing is clear: it has to happen, and it won’t happen by chance. Companies will have to find ways to put as much time, effort and bandwidth into innovation and learning and creating as they have previously put into efficiency and continuous improvement and business process reengineering. VB: You describe companies’ innovation imperative as being a “race for renewal”, to change as fast as the external environment, find new sources of profit to replace the disappearing ones, and reinvent strategies and business models before they become obsolete. If companies are not well along in this process is it too late for many of them, given the pace of change we are facing in the innovation economy? Rowan Gibson: For some, it may be too late. When you get behind the change curve today, it’s very, very difficult to catch up again. In the old days, if you stumbled or moved too slowly for a while, you could usually figure on getting back up to speed somehow. Now, when you stumble, you can pay a terrific price. Why? Because a lot of very aggressive competitors are standing in line to grab your business. And, guess what? You don't get it back! Look at the market share GM has lost to Toyota over the last decade. General Motors has not been able to increase its share again; in fact it has lost more. So, as the world gets more competitive, and as the pace of innovation in the external environment speeds up, you either accelerate in terms of innovation and strategic renewal or you get killed. Success in the past has never been a more inaccurate predictor of success in the future. Take another book by Jim Collins and Jerry Porras, Good to Great. Is that really the issue today: How do we go from good to great? Without doubt there are companies that have gone from good to great. But what we increasingly see is companies that go from “great to mediocre” or even “great to gone” at a very alarming rate. There is a sobering lesson in this for today’s organizations. The pace of innovation in the external environment is already going hypercritical. P&G, for example, estimates that the pace of innovation in consumer products alone has doubled in the last ten years. That means that the pace at which you refresh and reinvent your products, services, strategies, and business models must accelerate accordingly. VB: As a global business strategist you provide consulting services to assist companies in making the innovation journey to reach the tipping point where innovation is embedded throughout the enterprise—a systemic, distributed and sustainable capability. How do you go about assisting them to make the many changes that are necessary if they are to succeed in this journey? Rowan Gibson: Yes, I do assist companies with this. And, of course, we are talking here about a profound cultural change that requires considerable time, money, and commitment. In my experience, it can take an organization three to five years to build the kinds of skills, tools, management processes, metrics, values, and IT systems that are required to support ongoing, across-the-board innovation. And it can’t be done piecemeal—an innovation reward program here, a corporate venture fund there, or a few days of brainstorming somewhere else isn’t enough. In other words, the innovation journey is not a quick or an easy one. But neither were the learning journeys that organizations went through to institutionalize things like Total Quality Management, lean manufacturing, Enterprise Resource Planning, or Six Sigma. And the rewards that will come from making innovation a deep core competence will be at least as significant, if not much more so. Any organization that has struggled with these kinds of challenges knows that building an enterprise capability can’t be done with a quick fix. But it can be done. Building a self-sustaining, “all-the-time, everywhere” capability for innovation is fundamentally a leadership challenge—it’s something that absolutely has to be spearheaded by the CEO. Without the full engagement and commitment of the company’s leadership team, innovation embedment doesn’t stand a snowball’s chance in hell. Basically, what an organization requires to seriously get started with innovation embedment is a CEO who truly believes that the company has no other choice. That in the medium to long term there are no alternatives to innovation for growing revenues and margins. That the capacity for innovation is broadly though unevenly distributed—it should involve everybody and not just a select few. That while there is a substantial element of serendipity in any innovation, there is much you can do to increase the odds that serendipity will happen. And that raising the potential for innovation necessitates the removal of many organizational impediments. It requires a leadership team that takes principal ownership of the whole innovation embedment process—the process of actively building, sustaining and managing a corporate-wide innovation capability. These are the people I need to work with to drive innovation to the core of an organization. I take the company through a kind of staged Innovation Journey—discovering novel insights, generating a portfolio of opportunities, developing a strategic architecture, building and managing an innovation pipeline, rapidly redeploying resources behind experiments and projects, putting mechanisms in place to ensure management commitment to innovation, and so on. This has two important effects. First, throughout the “journey” people are becoming increasingly aware of the value of innovation, which in turn increases their motivation to make it a sustainable capability. Second, they are gradually uncovering the things that would need to change more deeply in the organization in order to build such a capability. In effect, as they progress through the Innovation Journey, they are developing their own rationale and design spec for organizational change. Unless a company’s executive committee is fully engaged in the Innovation Journey all the way along, solving these impediments would be almost impossible. The top dozen or so officers who make up the executive committee are usually the people who run the company’s core management processes—training and development, compensation, finance, and so on—and that’s where the impediments to innovation are invariably buried! Before these officers are willing to start taking their processes apart and bulldozing the things that frustrate innovation, they are obviously going to take a lot of convincing. VB: Of the numerous well-known celebrities and high caliber speakers you have shared the stage with during your presentations, who most impressed you? Rowan Gibson: Most of these people have impressed me, in some way or another. What I admire most about well-known management speakers—guys like Tom Peters, Gary Hamel, C.K. Prahalad, and so on—is their intellectual bandwidth. They just seem to be able to get a grip on so much of what’s going on. And they can see the connections between all these apparently disparate developments, whereas most people cannot. They seem to be able to join the dots, almost intuitively. It’s not just all that information that’s in their heads; it’s the deep understanding. It’s the unique insights they are able to form, and their ability to put their own personal spin on things. These are very smart guys, and they’re usually well ahead of the curve. I have to say I’m especially impressed with management speakers who can keep up the grueling pace of the international speaker circuit as they move beyond middle-age. Whenever I’m dragging myself out of a hotel bed somewhere in the world at some unearthly hour to prepare myself for the next speech, I often think of Tom Peters, who is now 65 years old. And I tell myself, “If Tom can keep doing this, so can you!”. My dear friend and long-time mentor, John Naisbitt, author of all those great future books like Megatrends, Global Paradox and, more recently, Mindset, is almost 80 years old. But he still travels like crazy to give his speeches. When I talked to him last week, he was just leaving for Brazil, and then on to Malaysia, and then China, where he’s working on a big trend project for the Beijing government. John and I were on stage together about a year ago in Austria, and he seemed to be fresher than ever. That’s what really inspires me. VB: What interesting projects are you currently working on, such as writing another book or studying a specific topic related to innovation. Rowan Gibson: I’d say the most interesting project I’m involved in right now is the creation of physical environments for innovation inside some of the companies I have been advising. You know, most big companies have some form of training center or research center, which they may have recently renamed their “Innovation Center”. But if I look inside those places, all I usually find is the same old, tired spaces for brainstorming or team meetings. Sure, they can put a few colorful beanbag chairs or hammocks in there to make the place look more creative. But what I miss is any kind of innovation methodology that is reflected in the space. So what I’m trying to do now is turn the processes and tools outlined in Innovation to the Core into an operating system and a design principle for the next generation of innovation centers. So it’s quite literally becoming a “blueprint”—this time an architectural one—for transforming the way companies innovate. Remember, Walt Disney had a dream of turning all his animated movies and characters into a giant, three-dimensional theme park. My dream is to create physical, three-dimensional centers where radical innovation can become a daily reality for my clients’ organizations. Innovation to the Core: A Blueprint for Transforming the Way Your Company Innovates provides easy-to understand, useful information about how to implement a “systemic enterprise capability” that will sustain innovation as a way of life. Rowan Gibson and his co-author, Peter Skarzynski, have given us a breakthrough book about breakthrough innovation. Rowan Gibson, who currently resides in Dusseldorf, Germany, is a global business strategist and an expert on radical innovation. As a consultant he shows organizations how to seize new growth opportunities, create new markets and transform around the paradigm of innovation. Rowan energizes audiences in Europe, North America and Asia as a keynote speaker with big-picture insights, observations and fresh business thinking.